....this book finally appears. I couldn't have hoped for a better moment in our country's national discussion than now. Regardless of anyone's preferences among presidential candidates, the dialogue in the past week spurred by Sen. Barack Obama's speech on race has reintroduced a seminal topic to millions of young Americans. Hopefully, Slavery by Another Name can contribute to a more clear understanding of how much more recently the most grave injustices against African-Americans remained commonplace. Acknowledging the terrors and tragedies that twisted the life of Green Cottenham, and ultimately killed him as a slave in 1908, is essential to understanding the racial divide in the U.S. today. To anyone who has followed this project from its inception with a story in The Wall Street Journal in 2001--especially my wife and kids--I'd like to say thanks. To anyone who reads the book, or hears me through the media, I hope you'll bring that national dialogue--and anything you might know about the re-enslavement of black Americans--to this blog. This harmful practice was also written about by Charsee McIntyre, the book is :CRIMINALIZING A RACE”. Dr. McIntyre,book was first published in the US, in 1992. However, I feel this practice is current with the numbers of African-American, HIspanics & poor whites imprisoned for many minor infractions. AMERICA IS STILL RACIST !! I taught adult students for 42 years, and Slavery By Another Name is a continuum of the history I brought to my classroom. It is a powerful account of history that is hidden from the public until someone of stature reveals it. This book is an incredible validation of the struggle of African Americans in the 20th century. Can you tell me name of the Artists signing “Nobody Knows the Trouble I’ve Seen” on your video? it is a beautiful rendition. Thanks again for your eye-opening research on this untold chapter of American history. Several writers in this bog have echoed my many complicated thoughts about this disturbing but sorely needed book. I too remember being puzzled when a deacon in my church told me that his “whole community picked up and left ” in the middle of a moonless Georgia night during the 1930’s. While I entertained more benign reasons behind the nighttime journey, the grave look in his eyes and world weary look on his face told me of the vital importance of the trip and the risk being assumed by the travelers was nothing less than a matter of life or death. My wife recalls her grandmother’s story about a female relative sold into slavery in Mississippi in the late 1880s; the last her family saw of her was the forlorn look on her face as she stood chained in the back of a wagon as it trundled away. In addition, my wife often has mentioned the epic and lonely train ride her grandfather took by himself—at age 15–from Wetumpka, Alabama, to Youngstown, Ohio, around 1920. Thanks to this book, I know something of the terrifying atmosphere and bleak prospects he left behind and better understand the motives a mother would have to send her only son north (less random racial violence, better job opportunities). In my own family, my Mom recently told me that her deceased father never expected to live long because his insistence on being treated like a man would very likely get him killed sooner rather than later. Reading this book has provided a partial explanation for my late Grandfather’s fatalistic but candid views. While the horrific stories of the people depicted in “Slavery…” helped me understand the conditions that lead many African American to leave the south during the early to mid 20th century, they also suggest the often heroic choices that some people made to remain behind and continue to live with dignity and purpose in a nightmare world that threatened to swallow them up at every turn. I am an African-American woman in my sixties whose family was part of the great migration to the north in the 1950’s. I can remember stories of families having to sneak away in the night with just what they could carry on their backs and I was always puzzled as to why this had to be. Thank you for your insight and I intend to get your book in order to be better informed. I just saw Mr. Blackmon on a taped appearance on C-Span (4/25/09). It has always been painful for me to see photos of Blacks being hanged or tortured for no other reason than that they were caught up in a very violent and racist period of U.S. history. Whenever I read about that period of man’s inhumanity for man, I am reminded how it is remarkable, that Black Americans have managed to survive and even thrive to this day. For me, it is easy to see how free labor (slavery) contributed to building the American economy. It is more difficult to understand how anyone who truly knows the history of slavery and race relations in this country can be against economic reparations for African Americans. The logistics of such is another issue. I can not, like many Blacks and Whites, pretend that the inequities between the races, by any measure, is simply due to Blacks having lack of initiative, intelligence, etc. What I will continue to do is ask God to allow me to continue to accept and respect all mankind reqardless of the torture (including waterboarding) and other degradating acts visited upon my ancestors. The effects of those horrendous acts of violence linger today, seen only by those who truly know the history of this country. Thank you, Mr. Blackmon, for your efforts to shed light on a very dark time in the United States. Mr. Blackmon… My ache, just for reading a few lines about the book… just for looking into the eyes of those in the photographs, is beyond words. Knowing things were worse than even thought, as horrific as they were already known to be, is a hard blow to the mind. Without knowing the awful secrets of what happened, I think we understand next to nothing of today. The remnants of those awful days that still remain in obstacles between us, silences, distrust and fear are rooted in this shocking past through which, without knowing of it, we’ve sleep walked. Sometimes you just want to go to sleep again… “when will all the cruelty and pain just end?” But it won’t until we awaken to it, and know how we got here, and even where we now are. Thank you Mr. Blackmon for the lump in my throat this morning, the pressure of tears behind my eyes, the ache in my belly… for the empathy which makes us all brothers and sisters as we try to face and address this seething history and its lingering smoke in the America we all share. — I’m a 60 year old white woman with a 20 year old son, and we both stiffened into silence when we first heard you speaking about your book… There is a hunger in our land for the truth about these things. Thank you again. By chance I happened upon the author at a recent book review. His book is consistent with the attitude and behavior I have suffered from southern whites all of my sixty-eight years. One memory etched in my mind was a car trip the family took when I was about eight from Texas to Tennessee. We came upon this vast cotton farm in rural Arkansas. There were cotton pickers as far as the eye could see. Looking back on that scene and having the benefit of Mr. Blackmon’s revolutionary book, I can’t help but feel that those folks were subject to some form of indentured control. It could have been the old company store crime. That of eternal indebtness. But, that is for another book. Only a white southerner could have written this book. Maybe, there is a god. This is was very hard for a fifty year old black man to read. Horrifying,unbelievable things done to my people in the name of the law. America needs to take credit for its greedy,brutal genocidal behavior that hurt so many Black people. Shame on you!! , You captains of American industry for stealing the labor and lives of Black people your quest for money. Everyone should read this book. I Just heard you speak about your book on c span…Great! I was surprised however that people on the panel were learning something new….haven’t they read Faulkner? This is one more example of the significance of a missing “Liberal Education”. I will certainly assign your book to my class. Thank you for your scholarly contribution. Moise. After listening to you on NPR I went out and purchased the book. I want to commend you for this important contribution to our understanding of American history. As a student of politics and history, I was shocked that I had been ignorant of the practice of forced servitude that existed in the South for so many decades after the Civil War. I, like so many others, thought of this period as one of Jim Crow Segregation and not a period which saw a new form of enslavement take hold. I hope that your book is adopted as standard reading in American history courses in our colleges and universities and that the information you have exposed is incorporated into high school history lessons. You have done the nation a service. I ran out of comment space before I ran out of comment 🙂 I am the proud mother and grandmo. of (3) daughters and (6) grandchildren and will be purchasing your book for each of their households, as well as my own, as “must read” literature, not foregoing Bible knowledge. Thank you and God Bless you. P.S. Your father, Bob Blackmon, left a very touching comment as to who you are and what you stand for, as he put it “moral fiber”. Still looking forward to that Obama/Blackmon “ticket”!!! Thank you , Mr Blackmom for the courage you have shown, by telling America the truth. My Grandmother lived to be 99 and my mother ,97 years old. I have heard these stories all my life. Black writers have been dismissed as `angry` . Have always found that term as curious from people who just can not deal with the truth. Curious because, if a child is angry and is telling you about the horrible abuse the child has endured…who says I don`t want to hear it, because the child is angry ? Present day Americans feel they should not have to face what has transpired in early generations. But they still are reaping the awful benifits and turn blind eyes to the fact that slavery continues in many forms in our America today. At age 72, while watching a Book review, on Cspan I heard the truth, spoken on national television. Thank you. I was channel surfing on 6/14/08 and saw the report on C Span. Thanks for your honesty and work in shedding much light on this sorrowful aspect of American history! I cannot wait to buy your book(s) because I want my children to have a broad knowledge of their history. I cannot wait to receive the 5 books I am ordering to pass along to friends as well. My father was 27 years older than my mother and told me countless stories of his childhood and the fact that he was held in servitude, how he went to prison and changed his last name. I am still trying to piece together my family history. I saw you on CSpan on this am (6/15/ 08) and was captivated!! I immediately ordered the books. Thank God for you. Please go on the Hannity and Combs Show. Hannity needs a history lesson. He is out of touch with America. Perhaps if he understood slavery and the impact that it has had on African-Americans he would have empathy for the Rev. Wright comments. Not that I agree with the context Rev. Wright used, I understand why he is angry. Hannity can say oh well lets all get along, honestly, it is easy for him because he has not lived nor can he ever understand the dismise of African-Americans in this country. Please tell Hannity that yes we are all Americans but we were not always treated as equal Americans under the constitution. I have just finished reading this wonderful, wonderful book. I will say there were times when I was reading it that I thought, “Will I be able to finish this?” The reports of terror and abuse are gut-wrenching. But the epilogue is so satisfying — reading how people now are struggling to reconcile this dark chapter in our history. From this blog, I can see I am like other readers in that I had little idea of the existence of neo-slavery. I will admit that there were times when I read this book that I struggled with the thought, “What is the matter with the South? !”, to have conducted such outrageous and systematic abuses. Then: ha! I got my come-uppance, reading about the lynching in my hometown (Wilmington, Del.) in 1903. Apologies, southern friends: we all struggle to own this our history. Thank you, Mr. Blackmon. You have enriched my life, and I am telling my “incredulous others” all about your book. I saw your book shortly after attending the screening of a film about a family that traced the history of three generations of Rhode Island slave traders which they discovered to their dismay was part of their heritage. Unfortunately I can’t at the moment remember the name, but I am fairly sure it will be broadcast on PBS on June 23. The young woman who launched the odyssey that resulted in the film has become active in leading the Episcopal Church to examine its own history and culpability. I saw the screening at the National Cathedral here in Washington and I was impressed by the very diverse crowd–clearly the result of active outreach–at the screening. Following the screening there was eloquent testimony from Many African Americans in the crowd, including commentary on present-day slave-like conditions in many prisons and on the need for reparations. It seems to me that your book, which I am in the midst of reading, is eloquent testimony to the need for reparations. In any case, I think it would be very powerful to join your testimony to the testimony of this film, which is being presented very much as a challenge of “Where do we go from here?” If you like, I could track down the contact information for the family which is presenting its film regularly in Episcopal churches. Have you considered working with churches? I think it is vitally important that your book have widespread exposure. Thank you for devoting a life journey to this. It is desperately needed. got your book. attended your lecture at birmingham public library may13 /08. excellent, keep up the good work. Congratulations for writing this magnificent piece of history which shows finally more of the shameful past that we need to know. I heard you on the WOSU radio station with Fred Anderle this morning, and was moved to tears. Your website also has more information about this book, which I shall buy for my family members. They deserve to know the history. We all do. THANK you Mr.. Blackmon for your contribution to this country. I DO hope that this will affect the outcomes in the presidential election and the outcomes of our American history, more than teh “myth.” THANK you. As a fellow Wall Street Journal reporter, I have long admired Doug’s stellar and meticulous work at the paper. I have been long anticipating “Slavery by Another Name”, which truly has exceeded my every expectation. I am so proud of you! “Slavery” is profound, haunting, thorough and simply a magnificent piece of scholarship. I was moved to tears after reading the repeated, inhumane lashings of these unfortunate victims! All the more stunning that it took the fears of propoganda during World War II to finally put an end to this hideous practice of neo-slavery tolerated in America for so long. It is high time to get the record straight in history books, to deepen the understanding of racism in America. Bless you, Doug for making this gripping story come alive today. LISTENED TO AN RADIO INTERVIEW HE RECENTLY DID HERE IN GULFPORT MISSISSIPPI, AND DECIDED TO VISIT HIS WEBSITE. I MUST SAY WHEN I SEE YOUNG BLACK MEN ON THE PRISON ROAD DETAILS I OFTEN SEE THEM AS MODERN SLAVES, EXCEPT THEY HAVE A CHOICE AND I’M AFRAID THESE PEOPLE DID NOT.OUR HISTORY IS SO VERY MUCH COVERED UP, IT’S GREAT THAT PEOPLE LIKE MR. BLACKMOM ARE REVEALING ATROCITIES SUCH AS THESE, WITH HOPES THAT SOON YOUNG FOLK WILL REALIZE THERES NO HONOR IN GOING TO SLAVERY, I MEAN JAIL. Word, son. This book is the truth. Something needs to be done to redress the situation though. Free-markets aren’t it. My mother, who is 90 told me about how she and her siblings escaped a neo-slavery situation. I believed that her situation –in rural Georgia –was rare and atypical. I had no idea how widespread it was. Yet another reason for our historical and current distrust of the white and the powerful. This history is a boil and nothing will ever be resolved until it is closely examined and lanced. Covering it up and hoping it will disappear will not work. Since childhood Douglas Blackmon has been passionate about race and the plight of African-Americans. He has written and spoken about the subject since he was in 7th grade, including a public debate with a Mississippi Delta farmer, a man 50 years his senior. Doug won! 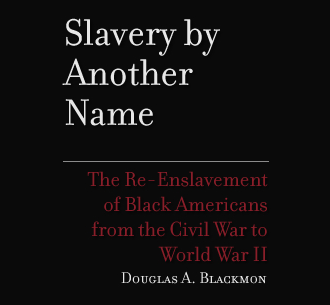 In addition to being an important and scholarly work, “Slavery by Another Name” reflects the moral fiber of the author. I have known him for a very long time. I am his father. Thank you Mr. Blackman for being who you are and for answering your calling. I have always contemplated why Blacks in America never asked or initiated to seperate from those who so abused and mistreated them for so long. I am aware of a small group who went back to Liberia Africa and that Marcus Garvey purchased some boats with the intent of taking the children kissed by the Sun back to the Motherland, but his plans where sabotaged. I really feel that true healing for the decendants of these abused slaves will not and can not begin until the Oppressed (seperate)permanently from their Oppressor. Certain powers and principalities have found that pure undiluted Blackness, offensive, frightening and also powerful, therefore the need to eradicate or either “weaken” that power was and has been a neccessary evil. Todays Blacks in America are the “result” of that necessary evil. May Mother Justice Come Save Her Children. Let us note that the cohabitation between Black & White did not come about peacefully or voluntarily. Forced and involuntary cohabitation between the two races will have to be addressed. If the force or source called GOD does not make mankind acknowledge it’s existence let alone “force” him to serve or worship it, then “who” gives mankind the right to do that which GOD itself has refused to do with that which itself has created? Has mankind made himself a God or THE GOD and is there a difference? Excellent interview on Imus. Was aware of the horrible Jim Crow laws but had no idea about your topic. Certainly puts Michelle Obama’s comment about finally being proud to be an American in perspective. This should be required reading in our high schools. I just heard your interview on the Imus Show. Excellent! Thank you for your research and for bringing attention to this little known aftermath of slavery. I never imagined that slavery had actually been continued in the South after Emancipation, and that the capitalist titans of the North would aid and abet this awful sin against humanity. Even having no illusions about how blacks lived then prepared me for this! Congratulations on the book once again. I’m very pleased that it has been so well-received and am certain that the many accolades are well deserved. I look forward to reading my copy and hope you sell a million more. I was happy to hear you on the Don Imus show. It was a great interview and, I think I’ll buy the book. I am so glad I listened to TOTN today. Your book is, of course, timely but is also a very important contribution to history. By bringing readers voices we never would have heard and making undeniable the legacy of the slavery that we were taught ended in the 19th century, you help to explain the pain and chaos that is just below the surface of every day life in the South, even today. I am crying as I write this. Your book brings to the forefront documentation of events and conditions that still impact African American people in this country. It is time for this discussion between blacks and whites. Soon after Imus, I went to your web site and was profoundly enveloped by the material.It is shocking that a 71 year old highly educated social activist like me was basically ignorant of neo slavery.What is even more shocking is that I, unfortunately,believe that the book will be very well reviewed and received by readers but ultimately you will have provided a huge service mainly to like minded souls. Hopefully this books impact will be as positive as it deserves. I’m an African-American man who listens to Imus (and has for years). One of the my reasons for that is his willingness to feature “unconventional” viewpoints. I am going to buy your book. I am also going to recommend it to my friends. The photo galleries are heartbreaking for me. Listened to you a short while ago on Imus. This is a must read. Thanks for the book and for this web site. Douglas A. Blackmon is available for interviews, book signings, and lectures. Schedule an event. Why must the Confederate banner come down?